The first year we rented we required after hours assistance as there were many missing things, including screens. We did receive good service. Our favorite feature of this property is its deep water dock and its location. We enjoy boating and visiting the Coastal Botanical Gardens. Blackberry Cove cottage needs blinds for the front window. The sun really starts to cook that place around 3 o'clock. 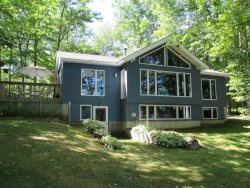 Everyone at Cottage Connection is very helpful and always very professional. Staying at Newagen Cove Cottage is always a special experience because it is a very special place. Its location is unique in that it overlooks an estuary, marsh area and, just beyond, the ocean. It is hard to find a combination like this anywhere. We worked with 3 agents early on and none of them even came close to the personal care that Lucy showed us. When it was all over my wife and I would consider Lucy family that is the only way that it can be said. Kudos for have her on your staff, Thanks again for a great stay. There was one very big problem we never wanted to leave. Very friendly and helpful staff. My son lost his photo ID on the flight up, and the team were very cordial and helpful in accepting a replacement by Fed Ex from my secretary back at my office. Tarbox Cottage was absolutely beautiful and isolated. A truly charming and well-maintained cottage off the beaten path. Both the cottage and the view from the cottage were very photogenic - could be on the cover of a travel magazine. The additional fire pit was a great idea and the location couldn't be better. We loved it.